Primary Natural Resources almost entirely agricultural. MALAWI IS A SMALL, landlocked country in central southeastern Africa. It is about the size of LOUISIANA or somewhat larger than CUBA. Like Cuba, Malawi is long and narrow. It stretches north to south for about 520 mi (835 km). It is only 50 to 100 mi (80 to 160 km) wide. Malawi’s borders MOZAMBIQUE on the east, south and west. Its western border is with ZAMBIA and TANZANIA lies to the north. Most of Malawi’s eastern border is Lake Nyasa (called Lake MALAWI in Malawi), opposite Mozambique in the south and Tanzania in the north. The east African Rift Valley cuts through the central African plateau for the whole length of Malawi from south to north. The Rift Valley creates Malawi’s two most prominent features: Lake Nyasa and the adjacent plateaus. Lake Nyasa fills much of Malawi’s part of the Rift Valley. The lake’s surface is about 1,500 ft (472 m) above sea level. The lake’s shoreline is a flat plain with many swamps. The Songwe River feeds Lake Nyasa in the north. The Shire River, the outlet for Lake Nyasa, flows south through Lake Malombe to join the Zambezi River as a tributary. Plateaus cover about three-fourths of Malawi’s land area. The plateaus have a varied terrain that includes plains, rounded mountains, inselbergs (“island mountains”), and forests. West of Lake Nyasa is a broad plain on top of the central plateau region. It averages between 3,000 and 4,000 ft (900 and 1,200 m) in height. The Dedza highlands on the southwestern edge of the central plateau border Mozambique. In the north are the Chimaliro Hills and the Viphya Highlands. The north’s unique Nyika plateau section reaches an elevation of about 8,000 ft (2,400 m). South of Lake Nyasa on the eastern side of the Shire River are the Shire Highlands. This plateau region holds Malawi’s (and Central Africa’s) highest point, Sapitwa (Mount Mlanje). Malawi’s climate is subtropical, with a rainy season (November to May) and a dry season (May to November). The dry season is much cooler than the rainy season. The highlands are much wetter and cooler than the lowlands. Rainfall in the highlands is about 90 in (230 cm) a year. In the Shire River Valley the rain is about 30 in (80 cm) per year. Temperatures in Malawi are affected by the season, altitude, and latitude from the south to north. Temperatures are hottest in the Shire River Valley just before and after the rains. Cooler temperatures occur in the higher elevations. Malawi’s ancient volcanic soils are very fertile. This has encouraged extensive agricultural activity as the basis of the economy. Most of the people of Malawi are Bantu speaking; English and Chichewa are both designated official languages. 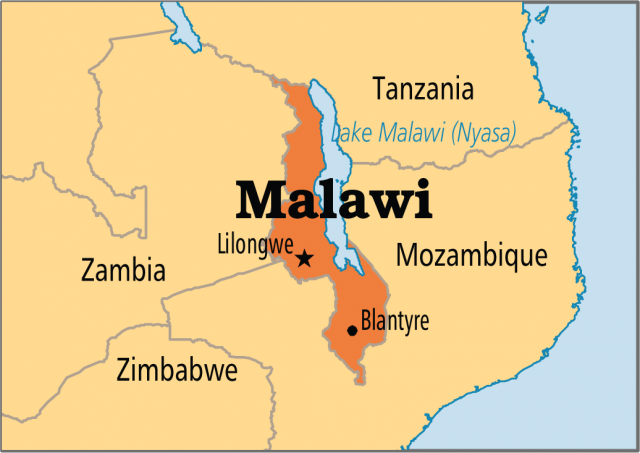 Since July 6, 1964, Malawi has been an independent republic.